Broken links or dead links are very common on websites. They divert visitors to a link which no longer exists. Such links will create a negative impact on your readers. In other words, it will affect your credibility and website SEO. If users get broken links again and again on your site, Google may degrade your search engine ranking. We should avoid that bad situation, anyway. Right? According to Google, webmasters need to scan their site at frequent intervals for broken links in order to avoid the penalty. But we know that it’s not practical. The job is easier for WordPress users as they can make use of dedicated plugins to find those links automatically. Others should go with online broken link finder tools for the purpose. Today we’re going to list 11 best broken link checker plugins and tools to detect and fix broken links in your website (both WordPress and non WordPress). Broken Link Check is a free online tool to find broken links on your site. It is easy to use. Just visit the page from this link and enter your website URL in the box for a free checkup. Wait for a couple of minutes to finish the scan. It depends on the size of your blog. Finally, it will deliver the list of your broken links along with error code and where they found. WP Broken Link Status Checker is a popular plugin to find and fix broken links on your WordPress site. It will scan for links in texts, images and send you a detailed report on completion. The plugin is highly configurable and lets you search broken links by post types, post status, comments, images, and also within a time scope. It also allows you to track links by levels (redirections, server error etc) and error codes (301 moved permanently, 404 not found etc) and thereby filter your results quickly. Link Checker is another broken link checker plugin for WordPress. We do not recommend using WordPress broken link checker plugins as it creates a significant load on your server and slows down the website. But Link Checker uses an external service to find broken links. So you can use it safely without affecting website performance and traffic. Link Checker is simple and easy to use. It can detect dead links in your web pages, images, and also in YouTube embedded videos. WP Link Status Pro is a premium broken link checker plugin to verify the accuracy of your content and image links. You can create multiple scans with different configuration settings to find broken links, redirections, nofollow, and forbidden links. It allows you to edit URL, manage redirections, add nofollow attribute, unlink, and edit anchor texts from the scan results page. 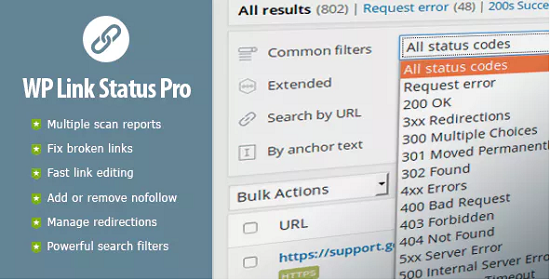 Filter the results based on various factors like content types, status codes, external URLs, internal URLs to find certain types of links quickly. URL tools is another advantage of WP Link Status Pro plugin. With it, you can make massive changes in a list of predefined URLs by adding or removing nofollow attributes, 301 redirections to them. 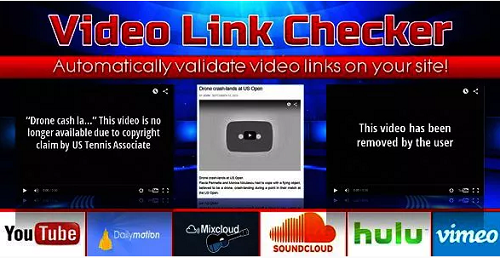 Video Link Checker is another broken link checker plugin from CodeCanyon. As the name indicates, it can validate and find broken videos on your website. It supports leading video hosting and sharing platforms like YouTube, Dailymotion, Soundcloud, Hulu, Vimeo, Google Drive, and many others. The plugin runs in the background and informs you if any video is removed from the source or blocked in your target region for whatever reason. It scans your website automatically for broken video links. But you can also run manual scans to verify links by post types, post status, embedded URLs, and others. Google webmaster account offers several options to manage and monitor a website. We all know about its URL submission feature. But how many of us are regularly visiting Crawl errors and internal links sections of the tool? Google continuously monitor your site and let you know if any error found on URLs. The information will contain the date when the broken link first detected, last found and source posts. You can make changes in the relevant posts accordingly. 11. Check My Links – A Google Chrome extension to scan a web page for dead links. Ideal for designers, developers, and content editors.